Mount Rainier is one of my favorite subjects. I have spent my life with this dormant volcano looking over my shoulder. In Western Washington State, it is a common phrase to hear that, "the mountain is out." What this really means is that it is a clear day with no rain or fog obscuring the glorious landmark. On a clear day, it can be seen from Seattle to Olympia, up and down the I-5 corridor. This particular painting is 8 x 10 inches. It can be purchased in my Etsy store for $80.00 plus $12.00 shipping to US address. Click here to purchase. This weekend I am visiting the Washington coast. The weather has been damp for two days and although it isn't snowing like it is inland, rain has been a constant. But this afternoon, the rain has dried up and I was able to get out. I caught a glimpse of sunlight reflecting off the green landscape of a point of land on a nearby lake. The sun on the evergreen foliage sparkled and was especially welcome after two days of moisture. 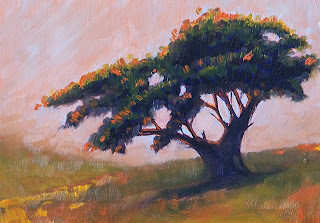 In celebration of my afternoon out in the sun, I painted this little 5 x 7 inch oil painting. It isn't quite April, but Western Washington State did have snow this week. It is an unusual occurance in this part of the country. 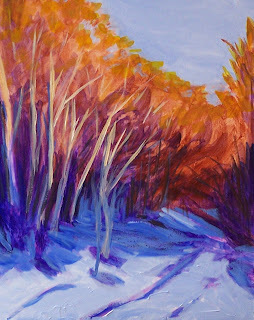 This 8 x 10 acrylic painting on gessoed hardboard is a reminder of the crazy weather week. Students are taking spring break and snow is falling, so out of character for the beauiful Pacific Northwest. 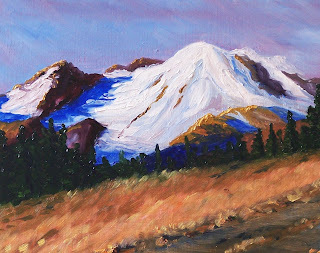 This is one of my favorite paintings of Mount Rainier in Washington State. It is inspired by the wildflowers that grow in the alpine meadows that surround the mountatin. Mount Rainier is an inactive volcano that is part of the Cascade Range. Anyone who has visited Western Washington State is likely to have had the opportunity to view this breathtaking mountain. On a clear day, it can be seen from Seattle in the North to Olympia in the South. I listed this painting for sale in my Etsy store this week and it SOLD immediately. 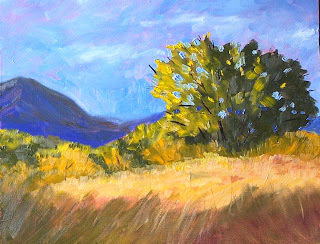 In this little hillside painting, I was working on capturing the effect of bare-limbed trees in the fall and winter season. It is a challenge to create this illusion, but I'm satisfied with the results. 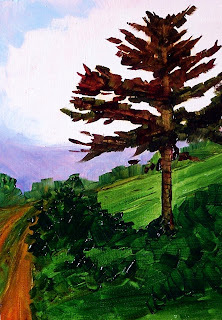 The painting is 5 x 7 inches on 1/4-inch gessoed hardboard. 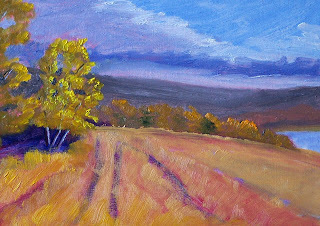 This little oil painting was inspired by a stormy sky and and the colors of fall. It is 5 x 7 inches on a gessoed panel. I began with a thin wash of alizarin crimson and ultramarine blue and built upon that foundation. This little 5 x 7 inch oil painting is one I painted last fall. Standing in the Skagit Valley, looking east gives visitors a glimpse of the Cascade Mountains. 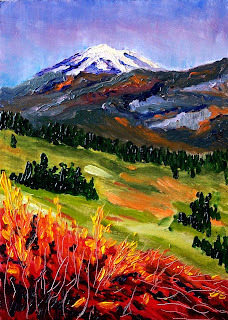 The painting presents typical fall weather in Washington State--cool and damp, but refreshing. I listed it for sale today in my Etsy shop. It can be purchased for $35.00 plus $6.50 for shipping to US addresses by clicking here. I also ship worldwide, so if you are not a US resident, click here for information on shipping everywhere else. 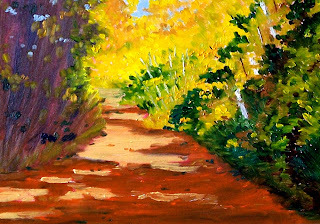 Painting this little 5 x 7 inch oil painting was almost as much fun as walking down a sunny forest path itself. 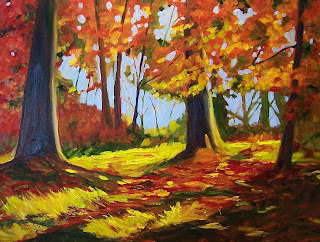 I love the bright colors and the way the leaves twinkle in the sunlight. 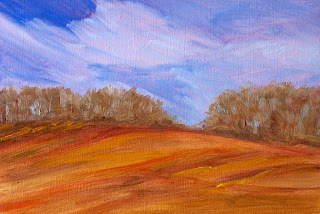 A foggy afternoon in October inspired this 5 x 7 inch oil painting. October is the foggiest month in the Pacific Northwest and this tree is a prime example of that damp time of year. The painting is listed for sale in my Etsy shop. You can purchase it for $35.00 plus $6.50 for shipping to US addresses by clicking here. I also ship worldwide, so if you are not a US resident, you can click here to check shipping costs for everywhere else. 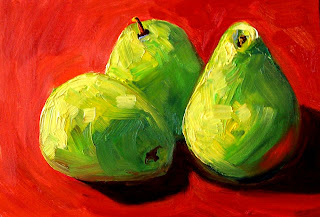 This 4 x 6 inch oil painting is one of two still life paintings I completed yesterday. I loved the bright orange of this collection of little fruit. 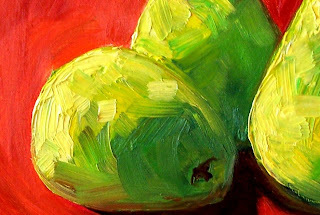 I haven't painted still life work for a while, but had the urge today. 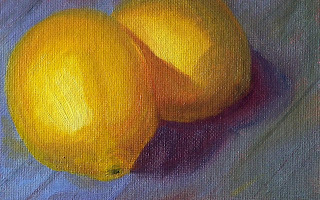 Lemons sitting on the table with sunlight peaking in helped put this little 4 x 6 inch oil painting on the canvas. When I finished this one I painted a second one which I'll post later this week. 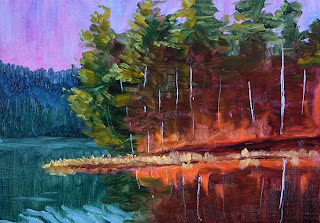 Alder Lake on a foggy morning looks a lot like this 8 x 10 inch oil painting. I like the contrast of the fall grass and the blue of the moist air. Although summer isn't here yet in the Northern Hemisphere, I think we are all beginning to pine for its beginning. 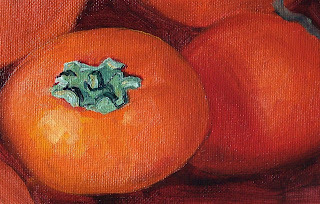 This little 5 x 7 inch oil painting is one I created last summer in the midst of summer fruit abundance. 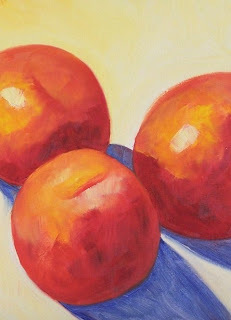 I love the beautiful colors of peaches and nectarines and the cool shadows they cast when warm sunlight falls upon them. This painting has SOLD. This 5 x 7 inch oil painting is of Flett Creek which flows through a pasture just north of the neighborhood in which I grew up. When I was very young, my brother and I used to go swimming in this creek, but when our parents found out, we were banished. They perceived danger--drowning was a distinct possibility in their minds. They just didn't understand the delight of dipping in a cool creek on a hot afternoon--it was absolutely wonderful! 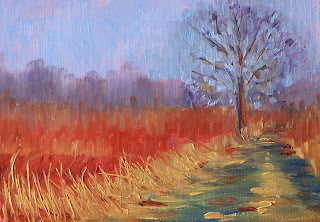 The colors of fall on a foggy morning road inspired this little 5 x 7 inch oil painting. Creating it gave me energy enough that I cleaned my studio and put up new shelving. It's too dark out now to snap a picture of my revamped studio, but perhaps later in the week I'll be able to do so. It feels good to be organized. This scraggy fir tree is typical of so many in the Pacific Northwest. I love the way it stands so tall and proud. Today's sunny skies provided a great backdrop to the dark foliage. 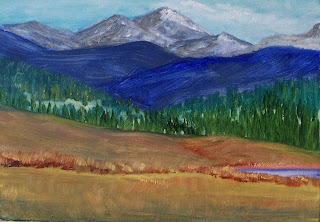 The landscape is painted in oils on a 5 x 7 inch gessoed hardboard. It has been a few days since I posted a new painting, but I have one to share today. 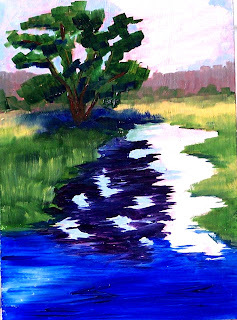 This 8 x 10 oil painting is another of my Nisqually Delta paintings. The delta is covered with scrub trees that provide homes for numerous birds and other wildlife. It is one of my favorite places in Western Washington State. 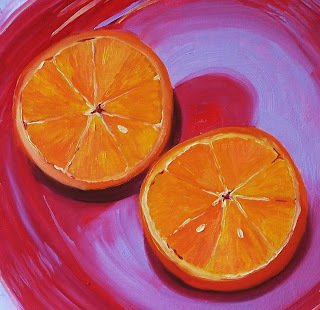 Today my little 6 x 6 oil painting, Oranges on a Red Plate, has been featured on Amy Esther's blog, In the Night Kitchen and on her Indiepublic page. I'm very flattered! I created this painting last spring and have always loved the bright color combination. It SOLD quickly from my Etsy shop. If you collect ceramics or just enjoy viewing beautiful handmade work, visit Amy's Indiepublic page. It is loaded with photos of a wonderful collection of her original ceramics. It is definitely worth a visit. Better yet, visit her Etsy store where you can purchase some of her functional ceramics and hand thrown pottery. Not familiar with Etsy? Click here to enjoy a visit to the Etsy homepage where everything is handmade. This little painting is one of my favorites. 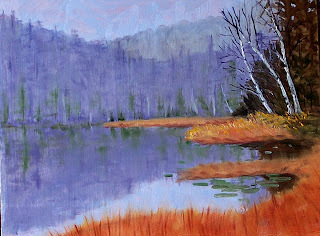 I painted it after visiting the Nisqually Wildlife Refuge in Western Washington State last fall. Travelling down one of the many paths that infest the area, I happened to look back and catch a glimpse of the lodge. 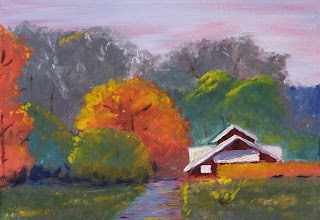 The color of the fall tress and the sunlight on the roof required that I paint. I am listing this little painting in my Etsy store this week. It can be purchased for $35.00 plus $6.50 for shipping to U.S. addresses by clicking here. This weekend I received the good news that two of my paintings have been juried into the 39th National Fine Arts Show at Ocean Shores, Washington. 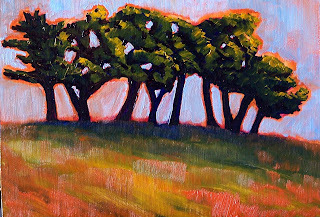 The 18 x 24 inch oil painting above will be on display April 11-13, 2008 at the Ocean Shores Convention Center along with another one of my paintings. You can click here to see last year's winners. The show is sponsored by Associated Arts of Ocean Shores and is accompanied by a national photography show at the convention center on the same dates. If you are in the area, stop by to see a wonderful show. I'm thinking of spring and warm weather. 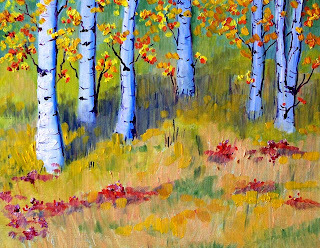 This oil painting was inspired by a grove of birch trees on a hillside meadow near Seaside, Oregon. It is 8 x 10 inches on gessoed hardboard.